Highly trusted and secure US online casino. Excellent deposit bonus for new players. Available on iOS, Android and Windows. Play Craps Now at Bovada! Bovada is one of the most trusted online casino names for US players. The company originated out of Bodog, who have been in business since 1994. Bodog was founded by Calvin Ayre who sold the US rights to the Morris Mohawk Gaming Group in 2007. While Bodog still operates worldwide, Bovada is the exclusive site for US players. 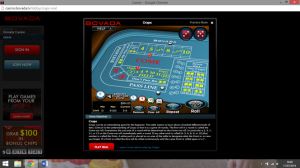 In this review of Bovada Craps, first you will find a brief overview of the company. Then the software is looked at, including its playability and what the games offer you. Next you can see what bonuses available along with the other games at Bovada Casino before finishing up with banking options and a look at the site’s customer support. Bovada became the US face for Bodog after 2011, when the government took action against major offshore poker sites. Bodog switched to Bodog.eu and Bovada.lv was created to serve the US market. This was following year with the DOJ seized Bodog’s redundant .com address and issued an indictment against Calvin Ayre. This was despite repeated rulings by World Trade Organization allowing the Caribbean Island of Antigua, where this brand was based, to legally provide games to the US. Bovada continues to operate legally holding a license issued by the Kahnawake Gaming Commission in Canada. The site is exclusively for US customers, with the exceptions of New York State, New Jersey and Maryland – and is enjoyed by thousands of citizens every day. Bovada is the top US online sportsbook and has a long standing reputation of security and hassle-free pay-outs. Bovada’s Craps game is provided by Real Time Gaming, a dependable casino software developer which originally formed in 1998. You can either download the Windows software package, or use the in-browser instant-play software at this casino. 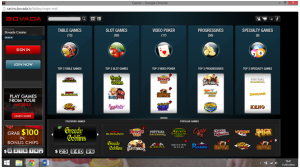 The downloadable software gives you a wider choice of casino games. Although there is only the one Craps game – the play is smooth and quick on both instant and download versions. The look of the table is authentic and easy to navigate, with dynamic highlighting indicating where you can and cannot bet once you hover over an area. Table limits are $1 – $1000. Your bet is selected by choosing the chip denominations at the bottom of the table. You can initially bet up to $100 on the Pass Line or Don’t Pass, although if you put too much down this can easily be decreased by using the ‘Remove’ button or clicking directly on your betting stack. When placing a bet a yellow tag will appear above each area telling you what the minimum and maximum bets are. After the point, you can bet up to 3x your pass line bet the odds. Point pay outs are 7:6 for 6 or 8, 3:2 for 5 or 9 and 2:1 for 4 or 10. This gives a blended house edge of 0.61% on pass line bets and 0.46% on don’t pass bets. Chips cannot be broken down lower than the minimum amount of $1 and payouts that result in uneven amounts are rounded down to the nearest dollar. Bovada advertise a $3000 deposit bonus, split between slots and casino games. This matches your deposit four times up to $500 to play slots and $250 to play table games, giving you the $3000 total. The slots bonus requires a 50x play-through before it is released, and casino requires an 80x play-through. Unfortunately Craps is one of the games NOT eligible to release the bonus. As a Craps player you can take part in Bovada’s Casino Benefits Program. You are automatically enrolled on this when you start playing and every $10 wagered at the Craps table earns you 2 points. For every 100 points reached you will receive $1 in casino chips every Friday. Minimum pay-out is $5 for 500 points with totals below that rolled over to the following week. The full selection of games on the downloadable software gives you a choice of 241 games including slots, video poker and 64 progressive jackpot games. Bovada also hosts some unusual specialty games such as the Chinese dice game Sic-Bo which uses three dice and provides you with up to 50 different bets. The flash client has fewer games although casino favorites such as Blackjack and Roulette can be easily found. As Bovada is designed for US customers their deposit options are chosen to make it easy for you to get money on site, although the best options may vary from State to State. Visa credit cards and pre-paid cards are generally the easy options favored by most. MyPaylinQ or Western Union are reliable choices. Bovada has an excellent reputation for fast cash outs, mostly via check. Other methods such as Rapid Transfer or MyPaylinQ may be offered as cash out options. If you have any issue regarding deposits or anything else customer support is available 24/7 via email or a telephone number found under Contact Us. Generally, support is quick to respond and both knowledgeable and helpful. 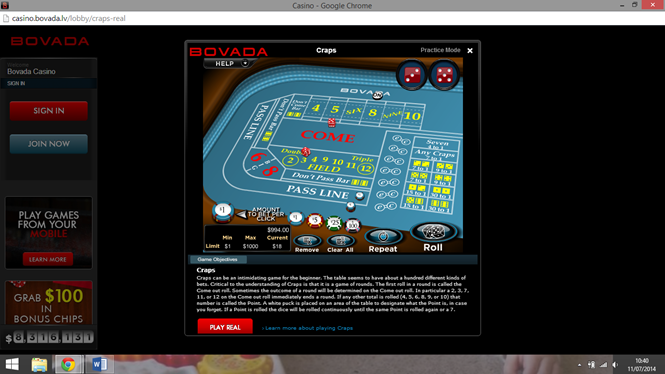 The Craps game at Bovada looks great and plays really smoothly. The rulings by the WTO have allowed this casino to continue to serve US customers in most States and thousands of residents enjoy the games here every day. Craps players on the site can gain extra value from the Bovada Casino Benefits Program and can normally get money on and off the site quickly and easily. Most secure US online casino. Slick design on website and mobile applications. Treats VIP players really well. Very knowledgeable customer support team. Cannot play from New York State, New Jersey and Maryland.